Moles are a very common skin conditions that we treat at Kallgren Dermatology Clinic in Boulder County, and people of all ages come to us for help determining whether or not these skin growths are a cause for concern. As it turns out, moles don’t always come with health risks, and most are simply an undesirable aesthetic that people want removed by a professional dermatologist. However, some types of moles do pose a danger to your health and wellbeing, which is why we are dedicating this blog series to various types of moles and their risks. That being said, here is what you need to know about moles. We’ve all seen moles before, and odds are, you even have a couple. Characterized by a brown or pink raised bump on the skin, moles (referred to as nevi in the medical community) are a cluster of melanocytes, or cells responsible for pigment production that can appear anywhere on the body. They can range in size from a few millimeters to nearly a quarter inch wide and can be found in groups or scattered across the skin. So what causes these mysterious brown bumps? This is still being debated in the medical community, though many dermatologists and doctors agree that genetics and sun exposure have something to do with it. What we do know is the different types of moles and which ones pose a higher risk of becoming cancerous moles. Though there are many different kinds of moles, most of them are both benign and removable. At Kallgren Dermatology Clinic, we regularly diagnose and treat a variety of moles and other skin growths, so here are some of the most common types of moles we see at our Boulder dermatology clinic. Commonly referred to as birthmarks because they appear at birth, congenital moles take many different forms and vary widely from person to person or even from mole to mole. While they are benign at first, congenital moles are more likely to turn into melanoma (skin cancer) during adulthood than other mole types, which is why many people choose to have them removed by a dermatologist when they reach their teen years. Congenital moles can be removed via surgery, dermabrasion, or excision, and can be lightened with a chemical peel or laser ablation. If you choose to leave them be, however, make sure to have them evaluated by a skin doctor or dermatologist if you notice any changes in the size, shape, color, texture, or pain level caused by your congenital moles. Also known as acquired moles, common moles are those that appear after birth, often during childhood or adolescence. Like congenital moles, they can occur anywhere on the body, however, the main difference is that they are more uniform in terms of size, shape, and color. Common moles are typically a quarter inch or less in size, round, flat or hardly raised, and are all the same color, though this can vary greatly among people with different skin tones. It is very rare for common moles to become malignant, as they are typically unchanging and painless. Studies do show that people with more than 50 common moles are at a higher risk of developing melanoma, though this is still relatively rare. Interested in learning about other kinds of moles? 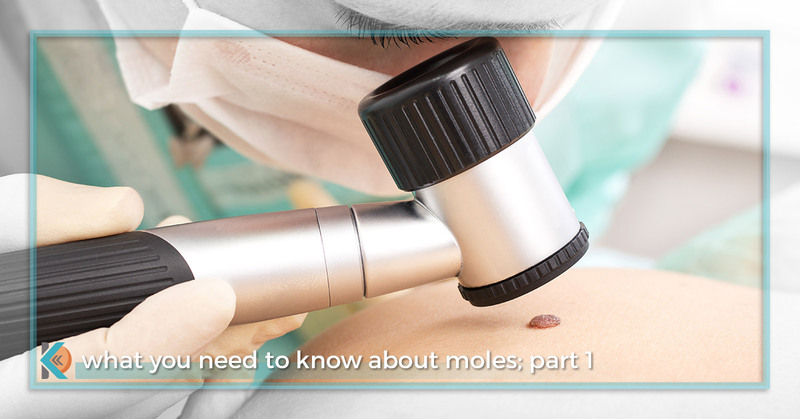 Continue on to part two of this blog series for more information about atypical moles, which pose more of a concern than the two types discussed in this post. Until then, feel free to visit Kallgren Dermatology Clinic in Boulder, CO or book an appointment online for one of our dermatology treatments. As experienced skin care professionals, we are proud to offer a variety of skin treatments at our Boulder dermatology clinic, including chemical peels, facial rejuvenation, sclerotherapy, and more. Visit us today!